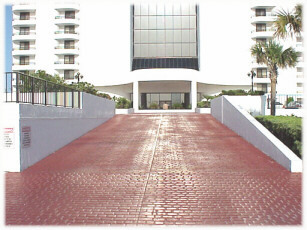 This Ocean Front Condo has over 1500 square feet of living space and over 300 square feet of balcony space. 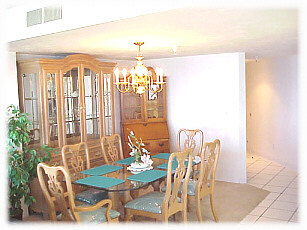 This 2 bedroom 2 bath condo is our home away from home. 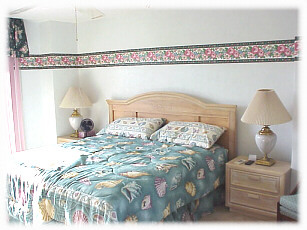 It is totally furnished, including linens, bath towels, beach towels, and more. Bring soap and food and you're set to go!! Located just south of Daytona Beach. This area is more relaxed and less crowded than the Daytona Beach area, but still within walking distance to many attractions. The large and spacious master bedroom has 2 balconies. The balcony on the east opens up to the Atlantic and the other balcony opens to the west. There is a TV with remote, alarm clock in both bedrooms are also equipped with ceiling fans. The master bedroom has a private bathroom and a powder room with a separate sink. The master bathroom has a tiled floor with a shower/tub combination. The Guest bathroom has tiled floor and shower. 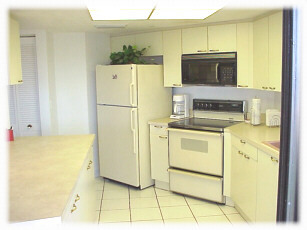 The kitchen comes fully equipped with all utensils, glasses, pots, pans, toaster, mixer, etc. It also has a tile floor with a breakfast bar. The dining area has a beautiful glass top table that seats 6. There is a china cabinet and desk. The large living area has a leather couch that opens to a queen size sleeper sofa (not extremely comfortable for a long period of time). There is also an overstuffed leather chair. There is a 21" color TV with VCR and remotes. 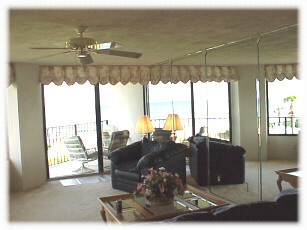 The living area opens out onto the balcony with a spectacular view of the beach and the Atlantic. Great sunrises!! Underground parking for 1 vehicle is provided. Plenty of guest parking outside. There is a area to wash your car underground if you would like to keep the salt spray off of it. Campers and trailers need special permission to park. Cable, phone, electric, garbage, all included. Building has private heated pool, private hot tub, private sauna, exercise room and pool table room. Lots to do in and around Daytona Beach. Daytona USA, Bikeweek, speedweeks, Octoberfest, lots of activities for all ages. 60 minutes from Orlando attractions. Great seafood everywhere!! No smoking inside. There are ashtrays on the balcony for those that choose to smoke. Please don't throw your butts off the balconies! Visit our other website at www.thesherwin.com for more photos and information. Year round, the weather is always nice here.